In computer science, a zombie is a computer connected to the Internet that has been compromised by a hacker, computer virus or trojan horse and can be used to perform malicious tasks of one sort or another under remote direction. Botnets of zombie computers are often used to spread e-mail spam and launch denial-of-service attacks. Most owners of zombie computers are unaware that their system is being used in this way. Because the owner tends to be unaware, these computers are metaphorically(เทียบเคียง) compared to zombies. 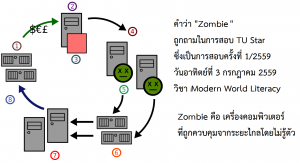 A coordinated DDoS attack by multiple botnet machines also resembles a zombie horde(ฝูง) attack.